The unique sound of the Marshall Tucker Band comes from their blending of rock and roll with country and adding in a dash of jazz, blues, and gospel. It’s this sound and hits like Fire on the Mountain, Heard it in a Love Song, and Can’t You See that helped make them one of the preeminent Southern rock groups of the 1970s. 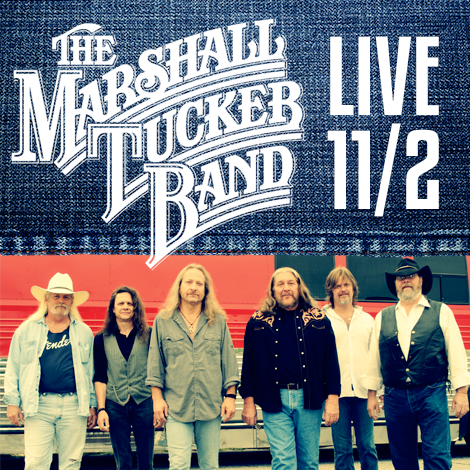 Still going strong and sounding better than ever, the Marshall Tucker Band is going to be playing an exclusive show for ATG’s dealers, partners, and industry friends at the Hard Rock on the Strip at SEMA this year! In case you haven’t kept up with the band, here’s a quick refresher on this iconic group and a few reasons why you won’t want to miss the show on Wednesday November, 2 at 8 pm. Many of the members of the Marshall Tucker Band originally played in the 1960s around the Spartanburg, S.C. area under the name The Toy Factory, before four members left the band to serve in Vietnam. Upon returning home, The Toy Factory revamped its lineup, and reformed under the name the Marshall Tucker Band in 1972, taking their new moniker from the name of a local piano tuner whose name was on the key to a rehearsal hall they used. After getting the band back together, the Marshall Tucker Band looked to take one more stab at musical stardom, while having fun and making enough money to buy beer for the weekend. Ask the members of the group and they will tell you that the passion for playing music they had way back in 1972 is still there today, and is one of the driving reasons for their success and why they are still touring more than 45 years later. Gaining early notoriety by touring with the Allman Brothers Band, the Marshall Tucker Band released its first self-titled album in 1973. Throughout the 70s the band saw commercial success, releasing a string of gold albums. However, their apex came with the release of their album, Carolina Dreams, which certified platinum, and its hit single, Heard it in a Love Song, which reached number 14 on the Billboard charts in 1977. Despite their commercial success, the band prides itself on the acts it played with, sharing the stage with legendary musicians such as the Grateful Dead, the Allman Brothers Band, Santana, and Fleetwood Mac. Furthermore, a fitting tribute to the band’s lasting effect on the music world is big-name acts like Poison, Kid Rock, Waylon Jennings, and even pioneering country music singer Kitty Wells choosing to cover the band’s songs. Over the years, the band has lost some members. Some sadly, like founding member Toy Caldwell who passed away in 1993. Others moved on to new projects or other interests. The joke now is the “new” band has been together for 25 years—but the new members have brought the same drive and passion for music that epitomized the early days of the Marshall Tucker Band. Going as good as ever, the band still plays between 150 to 200 shows a year! If you are going to be at this year's SEMA, don't miss our exclusive Marshall Tucker Band concert. Register for tickets below. We are so excited for this event and can’t wait to share a fun night of great music with our friends at SEMA. Tickets are general admission, so get there early!